Why do we “suggest” starting with a Grain Free diet for EPI dogs… something with 4% fiber content or less and to try and avoid foods with multiple legumes in them?????? Not because all grain is bad, but rather we, the EPI community, are referring to the fiber content of the food, and it is easiest to start looking in the Grain-Free food section first, but then we do advise to READ THE LABEL CAREFULLY, look for foods that avoid grains and legumes. Does this mean that all EPI dogs cannot tolerate grain?? Absolutely not. Some do very well on grain, but when there is difficulty getting an EPI dog’s condition under good control…. usually switching to a low fiber food, found in the grain free food section, greatly improves the situation. Why low fiber ??? 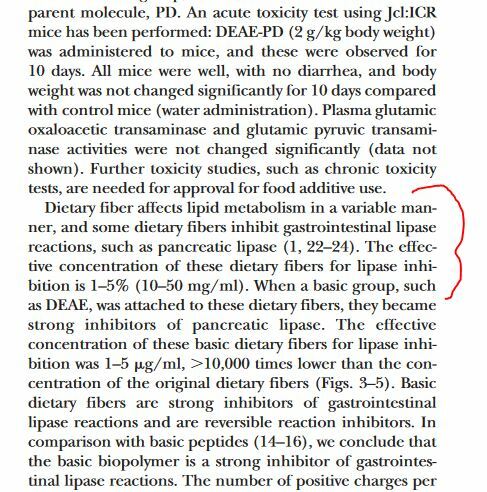 Because is has been proven multiple times with multiple research over multiple years that FIBER INHIBITS PANCREATIC LIPASE ACTIVITY. EPI patients depend on an outside source to supply them with the necessary pancreatic enzymes that they no longer can sufficiently produce on their own ….. and the last thing they need is to be given food that will destroy the very replacement enzymes anywhere from 0% to 50% that we are giving them. Unfortunately we have no idea which dog can tolerate how much fiber. This is why we strongly suggest starting with a low-fiber diet. However, it is totally up to the individual pet owner if they would like to try a food with grain. If the EPI dog does well on it, great… if not…. then again, we “suggest” trying various low fiber diets. Is going all low fiber always the answer??? Not completely……. 1. The problem with fiber is that there are 4 types of fiber (Soluble/Fermentable, Insoluble/ Lowly Fermentable).Many grains, fruits and vegetables often have all 4 types of fiber in them but in different concentrations and/or different types of fiber is in different parts of the food item. This information is on our “Fiber in Diets” page. 2. The predominant fiber is usually how the food is categorized. 4. The actual type of fiber can vary from one commercial batch of food to the next. 5. We have no idea how well and how much and what type fiber can be well-tolerated by which individual EPI dog given the fact that certain fiber inhibit enzyme activity. 6. The other problem with EPI dogs is that we now know that they all have SID (small intestinal dysbiosis) to one degree or another. To be treated if/when there are signs. 7. The problem with SID in an EPI dog is that low fiber intake can actually encourage SID, and yet too much fiber can inhibit the enzyme activity the EPI dog needs to survive. 8.This is why we often suggest adding a tsp of canned pumpkin, a little sweet potato, or what usually works very nicely is adding a small dose of slippery elm powder (a mucilage/prebiotic fiber with SCFAs in it) to a low fiber (grain-free) meal…. it is our way of feeding the EPI dog a diet without unknown amounts of fiber that may greatly interfere with their enzymes and yet give the EPI dog just enough of the right kind of fiber to aid in better controlling the ever present SID in the EPI dogs when SID gets a little out of control. Conclusion: During the end of 2018 and now into 2019 with the recent scare with cardiomyopathy and grain free foods, there are now some vets, vet nutritionists, etc… stating that grain free food is bad and for dog owners to stop using it…. Sadly this “blanket” claim is very disturbing and not 100% accurate for dogs with Exocrine Pancreatic Insufficiency. Like they say, the devil is in the details….. and the full details are not mentioned in TV, FB, internet soundbites and sensationalizing articles. What we need to remember is that EPI is a specific condition with specific requirements. The best i can do to fully explain this fiber and enzyme relationship is to cite multiple and specific EPI research below. I hope this helps quell any confusion about why we “suggest” low fiber food to begin with for “most” EPI dogs. If an EPI parent is having difficulty stabilizing their EPI pet, start with low fiber food, try adding your own minimal specific type fiber, if that doesn’t work…try various diets but keep detailed records of the ingredients to help figure out what food and in what percentage certain foods appear to best agree (or not) with your individual EPI dog. Until we have more answers as to why EPI happens, for now, this is the best information we have to offer. “Pancreatic Replacement Therapy for EPI, When is it indicated? What is the goal? How to do it? 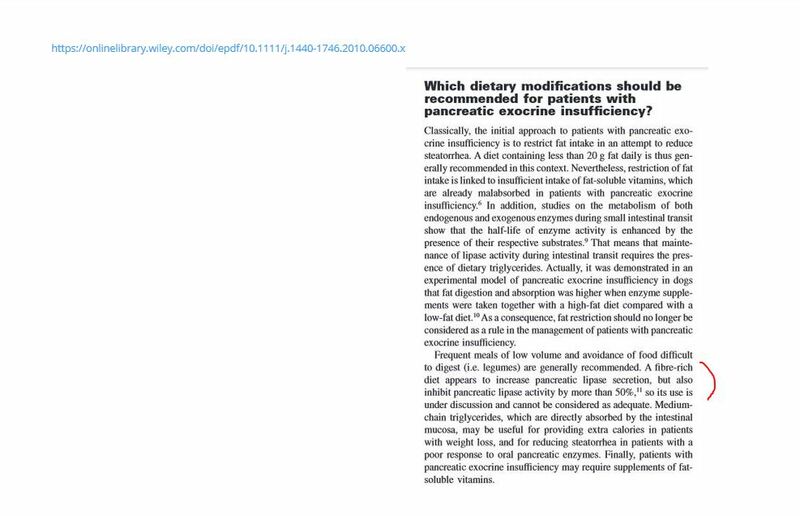 Dietary fiber has been found to exert an in-hibitory effect on pancreatic enzyme activities.